SAFE IN SOUND will make you feel the pounding in your chest and a rumble underneath your feet. 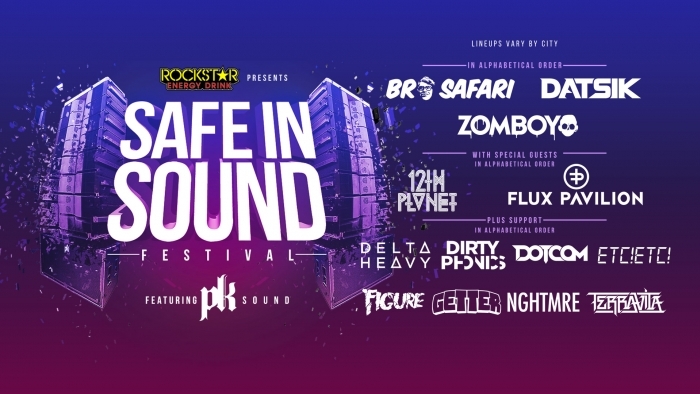 A first of its kind festival experience, Safe In Sound will hit 20 cities in September and October, setting a new standard for bass music presentation. Safe In Sound Festival will take over amphitheaters, arenas, ballrooms and various outdoor venues. PK Sound, already renowned for providing monster systems for Skrillex’s FullFlex Express Tour, Excision’s Executioner Tour and the Shambhala Music Festival, has set a new benchmark for the industry. With a brand new 150,000 watt rig debuting on the Safe in Sound Festival, PK promises to have built the most powerful touring sound system ever used for an EDM tour.